It’s that time of year again, what I like to think of as VMworld 2017 or Bust. In this blog, I will share with you some tips and things not to miss. As a technologist, if?you are serious about virtualization?then I am sure you share my sentiment it is VMworld 2017 or bust. WMworld 2017 is a conference that has not lost its technical prowess?to the marketing side of the?organization. It’s one of the many reasons I try to attend VMworld every year. All the ?SQL Saturdays I have attended. I suspect the PASS Summit still remains true to its technical roots. I have not attended the event in many years, but I have nothing but good things to say about the leadership of the PASS organization. 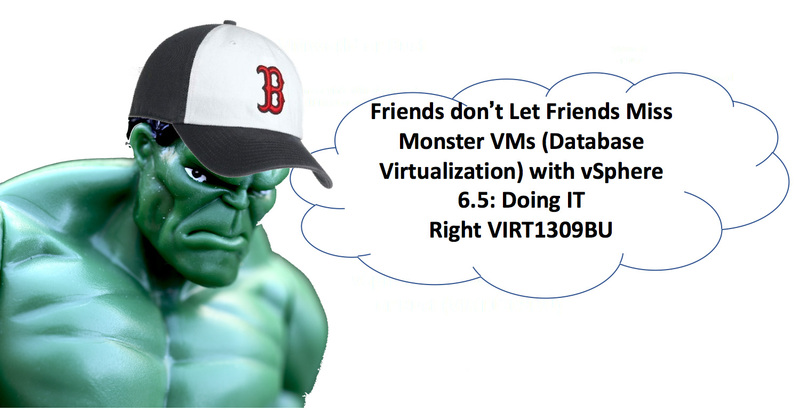 ?Last night David Klee and I put the finishing touches on our presentation for VMworld 2017: ?Monster VMs (Database Virtualization) with vSphere 6.5: Doing IT Right?VIRT1309BU. VMworld 2017 or Bust. For over six years, I have been blessed to be a top 10 presenter at VMworld both USA and Europe each day that I speak. Monser VMs (Database Virtualization) with vSphere 6.5: Doing IT Right VIRT1309BU is the best to date. ?This presentation has lots of great content. I would encourage you to take the time to sign up for Monser VMs (Database Virtualization) with vSphere 6.5: Doing IT Right VIRT1309BU. For the past six years, the presentation has sold out. It’s important to sign up early if you can. In addition, I will be doing an Ask The Experts Session. If Davids Schedule permits, he will be joining me. You will only see the BootCamps when you are registering for VMworld. They are Excellent. ?The boot are well worth the $725.00 Dollars for the day. All the instructors are excellent. You will only see the bootcamps when you are registering for VMworld. This is another reason why I always attend VMworld and say VMworld 2017 or Bust. The Microsoft SQL Server on VMware vSphere Bootcamp will provide the attendee the opportunity to learn the essential skills necessary to run SQL Server implementations on VMware vSphere. The best practices and optimal approaches to deployment, operation and management of SQL Server will be presented by VMware expert Deji Akomolafe and Microsoft MVP David Klee from Heraflux. This technical workshop will exceed the standard breakout session format by delivering real-life instructor-led, live training and incorporating the recommended design and configuration practices for architecting Business Critical Databases on VMware vSphere infrastructure. Subjects such as performance, high availability and disaster recovery with Failover Cluster Instances or Availability Groups as well as advanced storage architectures will be covered in depth. The Oracle on VMware vSphere Bootcamp will provide the attendee the opportunity to learn the essential skills necessary to run Oracle implementations on VMware vSphere. The best practices and optimal approaches to deployment, operation and management of Oracle database and application software will be presented by VMware expert Sudhir Balasubramanian who will be joined by other VMware and industry experts. This technical workshop will exceed the standard breakout session format by delivering real-life, instructor-led, live training and incorporating the recommended design and configuration practices for architecting Business Critical Databases on VMware vSphere infrastructure. Subjects such as Real Applications Clusters, Automatic Storage Management, vSAN and NSX will be covered in depth. This is another reason why I always attend VMworld and say VMworld 2017 or Bust. Business-critical database platforms are the last holdouts to enterprise virtualization. These systems are the most resource-demanding and latency-sensitive applications, and at the first symptoms of infrastructure challenges, the DBAs blame the infrastructure. Successful virtualization of these platforms requires a different approach to virtualization from other applications. The speakers will share their years of experience in virtualizing data platforms. You will learn how to validate your VMware environment and manage the performance properly. Scalability concerns will be addressed through discussions on scaling database VMs upwards and outwards as you work with the DBAs to manage the data lifecycle. Key talking points will help you learn how to perfect database virtualization from a technical, an organizational, and people level. Tuesday, Aug 29, 11:30 a.m. – 12:30 p.m.
Wednesday, Aug 30, 4:00 p.m. – 5:00 p.m.
SQL Server instances and databases deployed under VMware vSphere have to be available and reliable and perform well. This session will cover the options for achieving mission-critical SQL Server installations under vSphere, as well as what’s new in both SQL Server (2016 and vNext) and vSphere 6.5 that affects SQL Server availability. One of the biggest changes we will discuss is how support for SQL Server vNext on Linux will change the availability landscape for some. No matter what your role, if you are responsible for SQL Server, you should attend this session to hear the what’s new and what’s coming, and learn tips and tricks to keep you up and running. Wednesday, Aug 30, 8:30 a.m. – 9:30 a.m. Storage infrastructures can often be the most complex and confusing challenges faced by data professionals and architects in today’s enterprises. Every organization strives to achieve the right balance among the multitudes of necessary requirements to ensure optimal performance, security, reliability, availability, and (yes) protection of important data. Although failures are a given in modern network infrastructures, frequent and lengthy data/database performance degradation and outages are conditions that most modern enterprises cannot tolerate in today’s economies. This session provides a comprehensive discussion of the ways data professionals and architects can design a VMware vSphere infrastructure to provide the most resilient, risk-averse, and optimal designs for storage infrastructures and mission-critical databases. Thursday, Aug 31, 10:30 a.m. – 11:30 a.m.
Microsoft is enhancing SQL Server to run on the Linux operating system, a combination that will run best on VMware vSphere. Come to this group discussion and find out why SQL Server on Linux running on vSphere is such a compelling proposition. Wednesday, Aug 30, 10:00 a.m. – 11:00 a.m. Following the tradition of the past six years, VMware will facilitate an open discussion, moderated by Don Sullivan, on the subject of Oracle on VMware Technologies Licensing. The three major Oracle on VMware licensing firms (House of Brick, LC, and VLSS) will be present to answer questions in the unrecorded open group discussion. Wednesday, Aug 30, 2:30 p.m. – 3:30 p.m.
Oracle and SQL Server databases are licensed very differently than other applications. There are many options from which to choose, depending on requirements for features, mobility needs, virtualization/consolidation targets, and use of third-party cloud resources. This breakout session will help you understand the options available when licensing Oracle and SQL Server database virtual machines. Learn to maximize your database licensing investment while maintaining mobility and minimizing risks of an audit. This session will show the lifecycle of an application on the software-defined data center (SDDC). This includes provisioning, management, monitoring, troubleshooting, and cost transparency with VMware vRealize Suite. The session will also include best practices for running Oracle databases on the SDDC, including sizing and performance tuning. Business continuity requirements and procedures will also be addressed in the context of the SDDC. It is a formidable task to ensure the smooth operation of critical applications running on Oracle, and the SDDC simplifies and standardizes the approach across all data centers and systems. Thursday, Aug 31, 1:30 p.m. – 2:30 p.m.
Snapshots: Application-consistent, crash-consistent, VSS, Quiesced? what does it all mean from a technical perspective and how does it apply to Microsoft SQL Server? Snapshotting technologies are at the heart of data protection for Microsoft SQL Server, whether for backups, quick point in time restores, or full disaster recovery planning? know your risks! Discover through detailed lab testing how various snapshot technologies can protect your data and deep dive into specific (& often hidden!) risks of data inconsistency and corruption. There is always a line every year to attend the Hands on Labs at VMworld, so plan accordingly.? The VMware Hands-On Labs demonstrate the real value of VMware solutions in real time. As a VMworld attendee, you?ll gain special access to the latest VMware technologies without being required to purchase equipment, software or licenses. You?ll explore a wide range of today?s most exciting topics with a VMware-provided machine or your own device, all with product experts on hand to provide one-on-one guidance. Earn CloudCred points for taking labs, visiting HOL Connect and interacting with product experts, and win prizes for each level of achievement. Join us at VMworld in the North Convention Center, Lower Level, South Pacific Ballroom. Hands-on Labs Tours: These 30-minute tours provide a behind-the-scenes peek at what it takes to run our hands-on labs. The tour covers both business and technical topics focused on VMware products and solutions. You will meet lab creators and engineers running our multiple clouds. Sign up at the Hands-On Labs Tour check-in desk and engage with labs at a whole new level. The VMware User Group (VMUG) is an independent, global, customer-led organization, created to maximize members? use of VMware and partner solutions through knowledge sharing, training, collaboration and events. With more than 120,000 members worldwide, VMUG is the largest organization for virtualization users. There are several VMUG activities planned onsite at VMworld. To learn more about the VMware User Group community, visit the?VMUG website?and follow VMUG on?Twitter. Membership is free, so sign up and connect with us today! VMUG Advantage subscribers receive a discount on VMworld registration. Learn more now about the?VMUG Advantage program. If you go to VMworld, look me up. Better yet say hi at my session.